← Is that what I think it is? If I say the words “champagne, cognac, and burgundy” do you think of place names or drinks? That’s a trick question because in France they are both; capitalize the first letter and you have a region or town designation whereas if you pour these into a glass they are something to enjoy with a meal or just on their own. 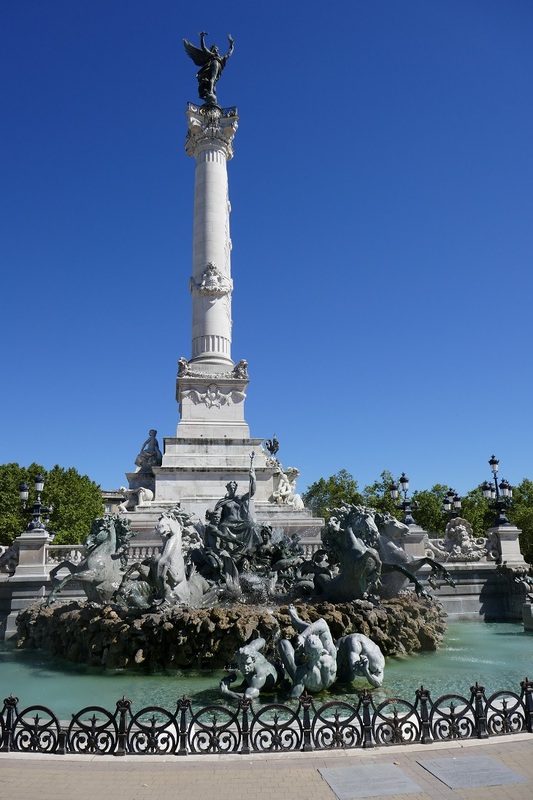 That also works for bordeaux: with a capital B it’s alternatively known as the “second Paris” or as the “capital of wine” while a small b gives you the familiar big, bold red wines that might include grape varieties we know such as cabernet sauvignon, merlot, and malbec. We had just a few days to discover both the place and the wine. Since we were staying around the corner from Cathedral St. André it made sense to start our tour there in a building that was consecrated by the Pope in 1096. About 40 years later the 15-year old Anne of Aquitaine married the future king of France, Louis VII. 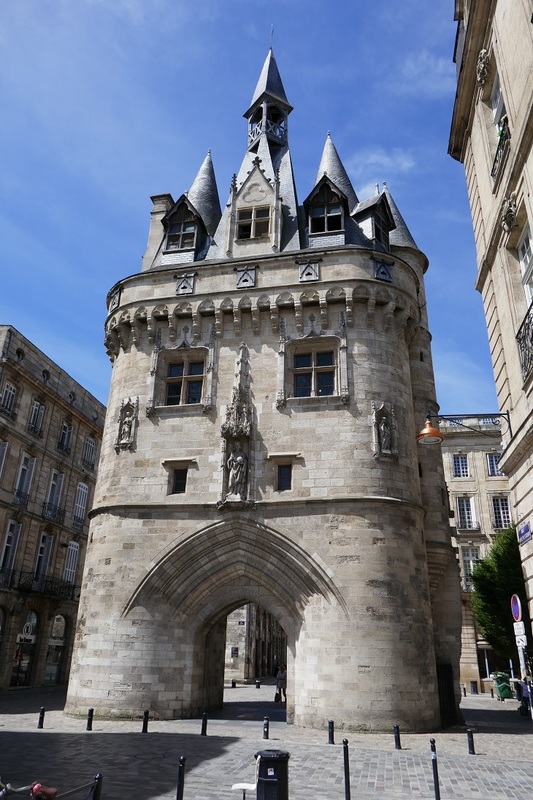 Then in the 15th century a separate bell tower called Tour Pey Berland was added so that large bells could be installed without damaging the structure of the cathedral. 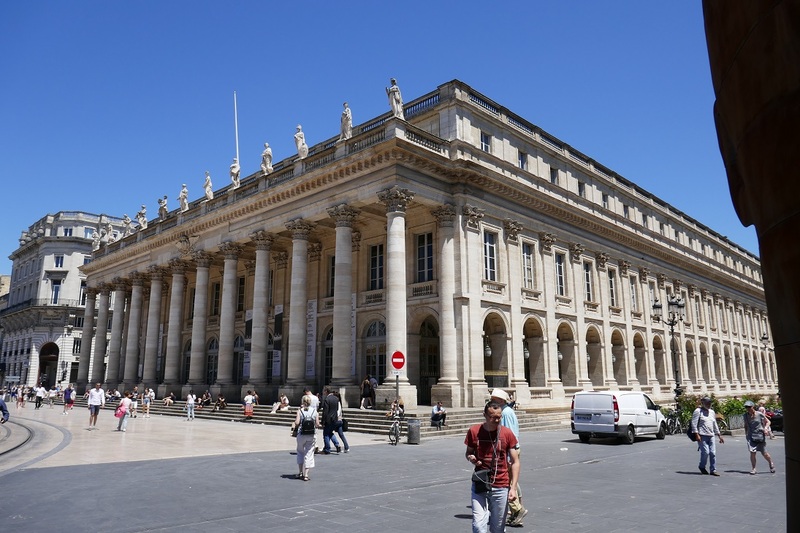 Built in 1780 the Grand Théâtre lives up to its name in both size and visual impression. The exterior is lined with huge Corinthian columns and topped with statues of goddesses including Venus and Minerva. It’s a fitting location as well for the start of the grandest, or at least longest pedestrian shopping street in Europe. At 1250 meters long (¾ mile) Rue St. Catherine, an original Roman road, begins at the Théâtre and ends at Place de la Victoire, that I wanted to see especially because it features a pink marble column that came from the quarries only 20 km (12 miles) from our house. Speaking of grand places, just one tram stop from the Théâtre is Quinconces that’s supposed to be the largest public square in Europe. There’s a giant fountain that I thought could be at home in Versailles until I read that it honored the Girondins a group opposed to the king during the French revolution many of whom lost their heads to the guillotine. One tram stop further is the Public Garden first opened in 1746 on land that was considered at the time unproductive for good grapevines. Just goes to show you how important the terroir really is to wine production. 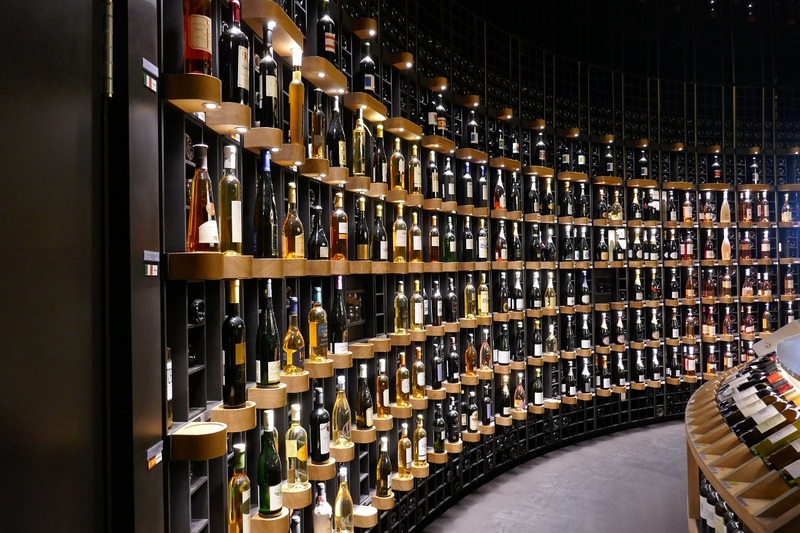 A museum with the name of La Cité du Vin (the City of Wine) sounded like the kind of place where we could spend a long time. It’s kind of like one of those touchy-feely museums for kids except with interactive displays for adults including imagery, sounds, and even smells that make the history and science of wine interesting. A guide told us that it would take 10 hours if you listened to, watched, and experienced every exhibit but we found 2 hours to be just about right before we headed up to the penthouse bar where a glass of wine included with our entrance ticket awaited along with a panoramic view of the city. 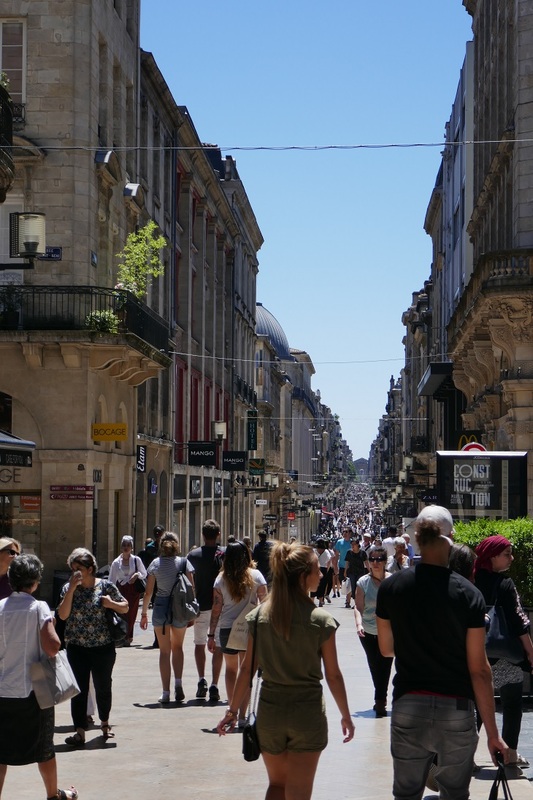 We ate lunch in the restaurant just one floor below while gazing down upon the Garonne river but we could have easily dined in the ground floor bistro or even the upscale snack bar which has much more down-to-earth prices. 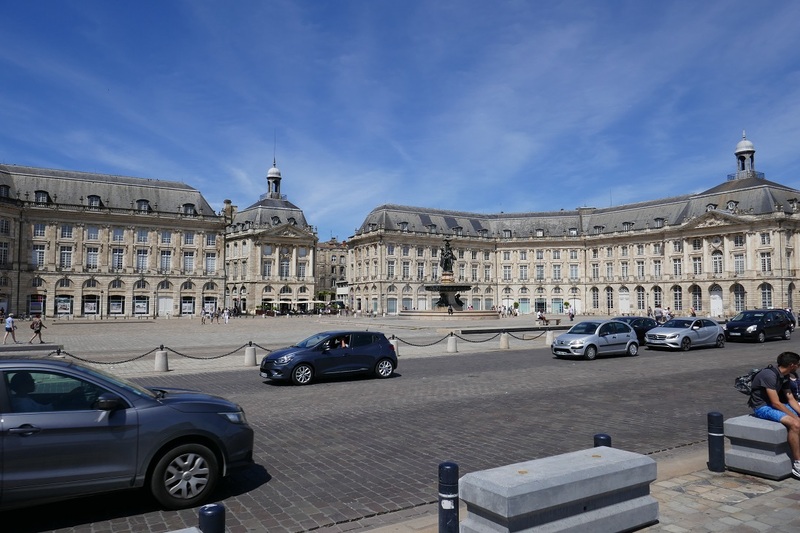 The most iconic photo representative of Bordeaux is at Place de la Bourse where the Palais (formerly the Stock Exchange) and the Customs Museum are housed in 18th century adjacent curved buildings that form a graceful semi-circle reflected in the Water Mirror fountain laid out on the plaza in front. Another site often associated with the city is the Grosse Cloche (Big Bell) constructed as part of a gate in the 15th century on top of the wall foundation from 200 years before that. The current bell, with 5 others preceding it, was cast in 1775 with a weight of 7750 kg (17,000 pounds) and is generally rung only once a month to avoid the cracked fate of its predecessors. A second gate of similar size and age, but without a bell, is Port Cailhau built in 1495 to honor King Charles VIII. I read that if you go inside the gate there is a sign in front of a door frame advising you to be aware of the lintel since the king had died at the age of 27 after accidentally striking his head on one at Amboise Château, his place of birth. 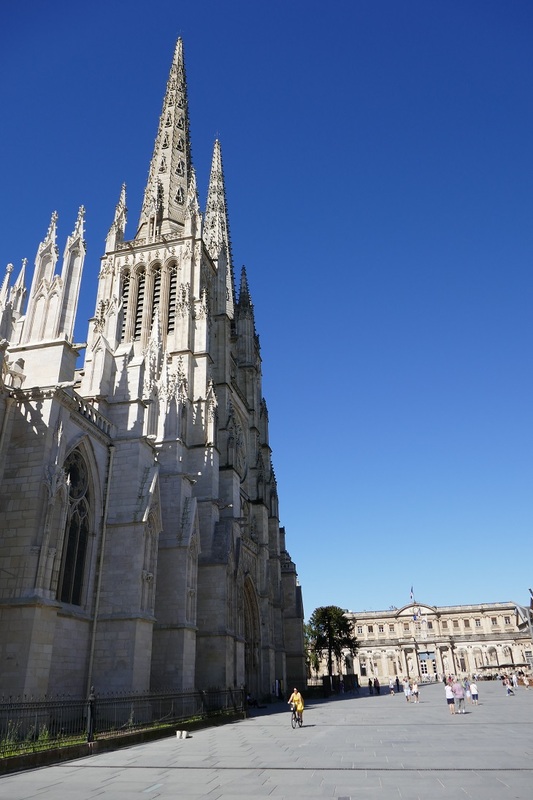 Just as Carcassonne is a stopping point along the pilgrimage path the Camino de Santiago (our blog post) Bordeaux is too so we went to see 2 basilicas that welcome the walkers. The fairly modest Basilique Saint-Seurin has an 11th century crypt on top of which the current church was constructed in the 14th century. On the other hand, Basilique Saint-Michel from the same time period has a bell tower that soars to 114 meters (374 feet) that we could easily spot from all over the city. We visited on a day when a big flea market was being held with many of the booths covered by the equally large shadow of the rising tower. 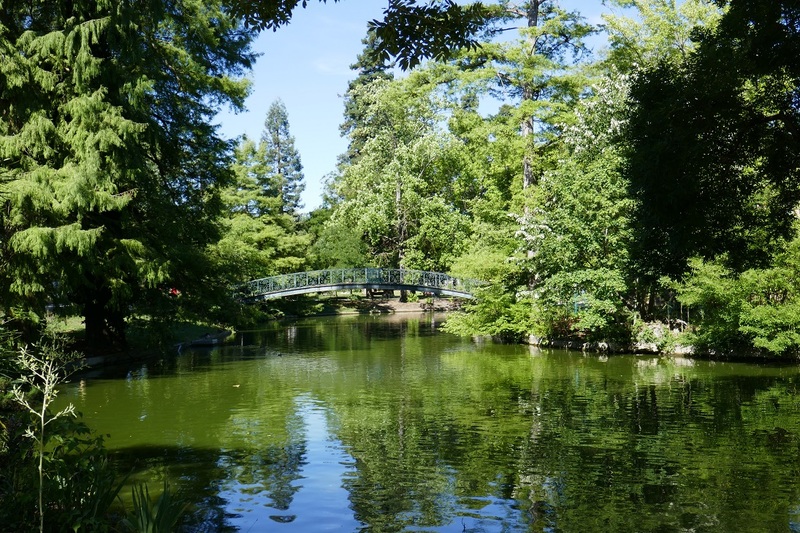 It was a very short walk from there over to the Garonne river that forms part of the 700 km (435 miles) network of waterways, including the Canal-du-Midi through Carcassonne, that allows inland transport between the Atlantic Ocean and the Mediterranean Sea. 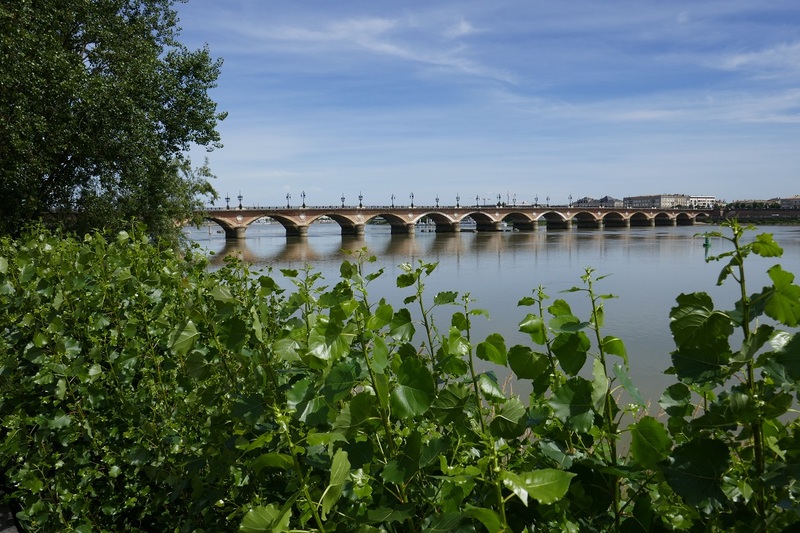 This is where the 17 arches of the Pont de Pierre (Stone Bridge) cross the river. 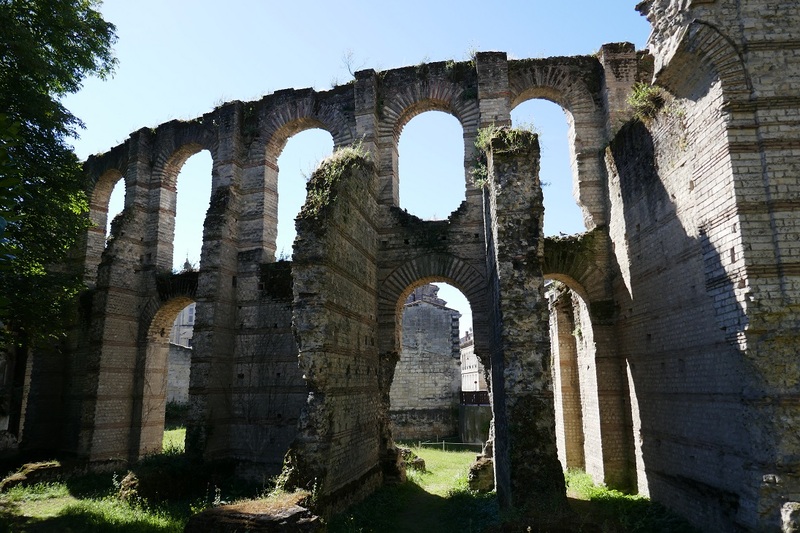 We started our trip to Bordeaux with a visit to the city’s newest attraction, La Cité du Vin, and we ended with its oldest, the amphitheatre of Palais Gallien from the 2nd century AD. Each time we see a different French city I always look for the evidence of Roman civilization. On our first visit to Paris I was shocked to see the ruins of an arena nearly 2000 years old right in the middle of the capital yet they exist here as well in this wine capital. 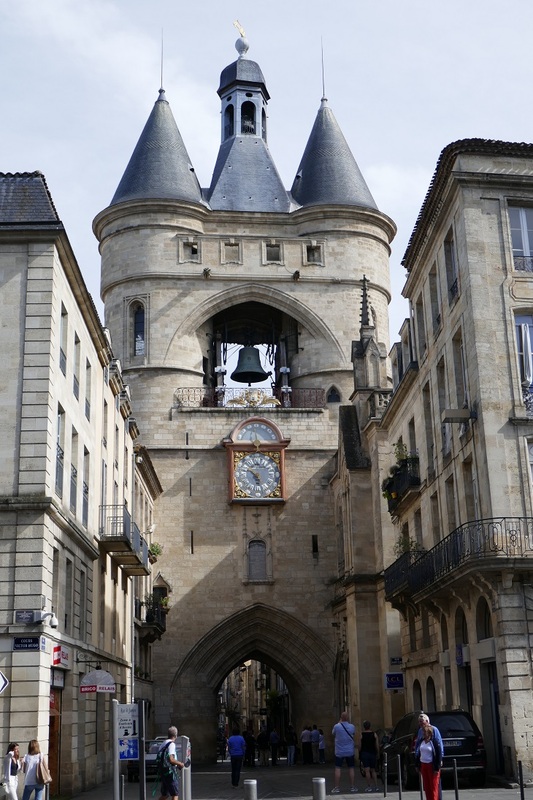 To get a “taste” for the wine, we took a day trip out to the beautiful Medieval village of Saint-Émilion. That post will be out next week. Posted on September 2, 2018, in Life in France, Travel in France & beyond and tagged Americans in Carcassonne, France, Wine. Bookmark the permalink. 2 Comments. We were in Bordeaux on the 27th of August 2018. Our cruiseship was moored quite to the Pont de Pierre. We saw a few of the sights which you mentioned. What a lovely city!! Full of interest.